In 1993 I was an undergrad at the University of Illinois. With the home of NCSA Mosaic on campus, my introduction to the web came very early. Back then little content existed though, so I didn’t really see the point of the hype about Mosaic. That attitude changed when I found the first online version of the Principia Discordia . Jane Patterson and Eric Tilton at Willamette University had turned this hard-to-find cult book into HTML and allowed the world access to it. I had recently read The Illuminatus! Trilogy by Robert Shea and Robert Anton Wilson, which heavily references the Principia Discordia, but hadn’t imagined I’d find a copy. 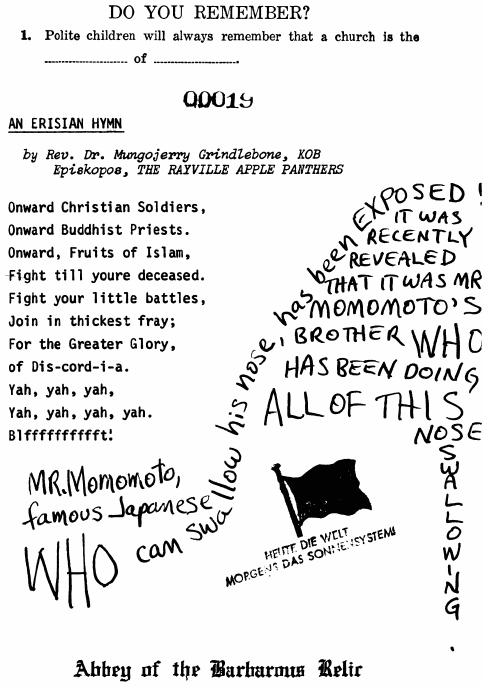 The Principia Discordia is a collage in book form of drawings, pictures, stories, poems, and cartoons that describe and exemplify the joke religion of Discordianism. It wasn’t the sort of book you found at the local bookstore, or the town library. I did eventually find a copy of one of the manifestations at Powell’s in Portland, and ordered two others through Amazon.com, but that was years later. Malaclypse the Younger (Gregory Hill) originally wrote the Principia Discordia of How the West Was Lost (with some material from Kerry Thornley and others) in the mid-60s and published five copies using a borrowed Xerox machine. In 1975 Shea and Wilson published their cult science fiction conspiracy theory novel The Illuminatus! Trilogy . Many people believed the Principia Discordia quoted within it to be fictional due to its limited distribution. This lack of copyright has led to the many expressions, both in print and online that have appeared throughout the years. I have three bound copies, from Loompanics , IllumiNet Press , and Steve Jackson Games . Books in Print lists another from Revisionist Press . Each has the same core, but with differences: additional introductions or afterwords and in the case of the Steve Jackson Games version quite a bit of additional material at the end. Online, there are manifestations that are scanned images of the Loompanics edition and various straight text and HTML versions as well as a translation into German. More recently the Principia Discordia has spawned other stuff from a collage series by Paul Watson, an artist in the UK, to t-shirts, coffee mugs, and a coloring book via CaféPress.com, to a Principia Discordia card in the game Illuminati New World Order . From that initial publication of five items, the Principia Discordia has spread further than its author probably could have imagined. While still hard to find in libraries and neighborhood bookstores - the Library of Congress lists the Loompanics edition in its collection, and searching OCLC’s WorldCat turns up about 35 libraries with various print copies in their holdings, and one with a reference to Eric Tilton’s electronic version - the spread of the web has allowed for much exposure to the online editions, and also, through online bookstores, the print editions as well. Interestingly, the libraries disagree on which Dewey or LC classification number it should be shelved under. Libraries put it in American Literature 1961-2000, Wit and Humor, Satire and Humor, Philosophy of Religion, or Parapsychology and Occultism. Searching Google for “principia discordia” retrieves 128,000 results from a broad range of pages. The Principia Discordia has crept its way into the private collections of many a Science Fiction reader, as it did mine. The Rough Guide to Cult Fiction mentions the book in their entry on Robert Anton Wilson. Wilson discusses it in his encyclopedia of conspiracy theories, Everything is Under Control , and in quite a few of his other nonfiction books. The Wikipedia entry on it sits in its “Religious texts” category. Camden Benares references it in Zen Without Zen Masters . It has also infiltrated the collections of those with an interest in conspiracy theories and alternative religions. Via Amazon.com’s “Look Inside this Book” feature and Google Print, I found references to the Principia Discordia in books as diverse as The Encyclopedia of Cults, Sects and New Religions by James R. Lewis, Rebels & Devils: The Psychology of Liberation , by Christopher S. Hyatt, Hack Attacks Encyclopedia: A Complete History of Hacks, Phreaks, and Spies over Time by John Chirillo, and Drawing Blood by Poppy Brite. The Principia Discordia spread because of the Internet. In the early 1990s the Usenet group alt.discordia was active, and later the Principia Discordia spread rapidly across the web due to the many links to it. The lack of copyright lead Patterson and Tilton, and those who have followed, to put the Principia Discordia online and to expand it. The piecemeal nature of the text allowed it to be read comfortably online, since it definitely didn’t need to be read straight through. The Internet had not yet been adopted by businesses and we were all still seeing what this new medium could do. Before this class, while I had collected the different published copies of the Principia Discordia, I hadn’t thought much about the differences between them or what it meant to say I’d read the Principia Discordia. I collected mostly due to a vague sense of wanting completeness and due to available shelf space on my bookcases. I now have a new perspective with which to view even works, such as the Principia Discordia, which, before, I read only for entertainment. Benares, C. (1993). Zen Without Zen Masters. Phoeniz, AZ: New Falcon Publications. Doherty, B. (2004). Historia Discordia. Retrieved October 23, 2005 from http://reason.com/0408/ cr.bd.historia.shtml. Jackson, S. (1994). Principia Discordia or How I Found Goddess, and What I Did to Her When I Found Her. Austin, TX: Steve Jackson Games. Malaclypse the Younger. (1980?). The Principia Discordia or How I Found Goddess And What I Did to Her When I Found Her. Port Townsend, WA: Loompanics Unlimited. Malaclypse the Younger. (1991). Principia Discordia. Lilburn, GA: IllumiNet Press. The New Hacker’s Dictionary. (n.d). Retrieved October 23, 2005, from http://www.outpost9.com/reference/jargon/jargon_toc.html. Principia Discordia. (n.d.). Retrieved October 23, 2005 from http://en.wikipedia.org/wiki/Principia_Discordia. 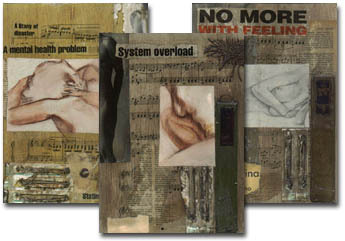 Principia Discordia: a limited series of 100 collages by Paul Watson available for sale from the lazarus corporation. (n.d). 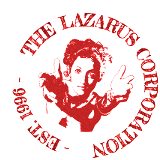 Retrieved October 23, 2005 from http://www.lazaruscorporation.co.uk/v4/lazarus/principiadiscordia.php. Raymond, E. (2002). Homesteading the Noosphere. Retrieved October 23, 2005 from http://www.catb.org/~esr/writings/cathedral-bazaar/homesteading/index. html. Shea, R. & Wilson, R.A. (1984). The Illuminatus! Trilogy. New York: Dell Publishing. Simpson, R., Bushell, M., & Rodiss, H. (2005). The Rough Guide to Cult Fiction. London: Haymarket Customer Publishing. Wilson, R.A. (1992). Cosmic Trigger Volume 1. Scottsdale, AZ: New Falcon Publications. Wilson, R.A. (1998). Everything is Under Control: Conspiracies, Cults, and Cover-ups. New York: HarperCollins. Copyright © 2005 Kristin Buxton All Rights Reserved.